Hours: Mon-Wed: 5 p.m. - 11 p.m. Thurs-Fri: 3 p.m. - 12 a.m. Sat: 12 p.m. - 12 a.m.
Sun: 12 p.m. - 11 p.m.
Their co-creation has never been the Lower East Side’s best kept secret. In the brunch-crazy metropolis of New York City, the Clinton Street Baking Company is legendary. Their daytime menu is heavy on breakfast items, and the nighttime menu offers breakfast for dinner, in addition to buttermilk fried chicken and burgers. It’s this focus on comfort food and familiar American classics that gets folks lining up down the block. Fresh, locally grown produce is a prominent part of the food served here, and local suppliers are used for every- thing. “We always go to the market and get as much as we can in season, particu- larly in the fall, summer and spring,” says Lahman, “and then we have purveyors that we’ve used for many years — people we know and trust.” These locally grown ingredients are sourced from farms (Blooming Hill Farm, Migliorelli Farm, Satur Farm) in New York and New Jersey and provide the eatery with organic aspar- agus, butternut squash, apples, pears, kale, green tomatoes and carrots, some of which are featured in the Market Soup of the Day. The Kale Salad is another popular veggie-forward selection that features baby kale, hunks of avocado, cherry tomatoes, red onion and spiced green pumpkin seeds. The veggie sandwich goes all in with fresh produce, as well, with beefsteak tomato, avocado, romaine, alfalfa sprouts and a mix of farm greens that earn a spot on many dinner plates. 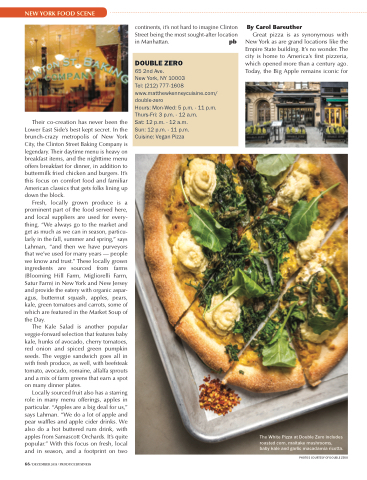 The White Pizza at Double Zero includes roasted corn, maitake mushrooms, baby kale and garlic macadamia ricotta.